A series of new interior and exterior images of the demolished George Bellshill have been added, thanks to Grant McLeod, Bruce Peter, and the Scottish Screen Archive at the National Library of Scotland. New interior shots have also been added for: the New Parade in Dennistoun, Glasgow, the Paisley Picture House, the Penicuik Playhouse, the Picture House Alva, the King's Brechin, the Savoy Cambuslang, the La Scala Clydebank, and the Regal Coatbridge. All of the above are courtesy of the Scottish Screen Archive at the National Library of Scotland. A planning application has been submitted for a change of use for the B-listed former New Tivoli in Edinburgh from a bingo hall to a 'place of worship and community facility'. The building has been empty since the bingo closed in 2006. The B-listed Olympia in Bridgeton is up for sale; complete with planning permission to convert it into flats. A Listed Building Consent application (HM/07/0836) to demolish the B-listed La Scala in Hamilton has been submitted to South Lanarkshire Council. First success for the 'Unknown' cinemas page - it looks very much like one of the sets of photos of the 'Unknown CAC Cinema' is of the Playhouse Buckie (compare with this modern interior photo here); many thanks to Jim Brooks and David Low for their comments and memories! In Edinburgh, we have new pages for the demolished Alhambra, the Blue Halls, the Gaumont, and the Salisbury, as well as the Electric Theatre in Dundee. Plus, new pages for the La Scala / Coliseum in Airdrie, the Regal in Anstruther, and the Playhouse in Oban. These new additions are all courtesy of the Scottish Screen Archive at the National Library of Scotland. A new page has been added for photographs and images of unknown buildings, that we'd welcome some help in identifying! Another new page has been added for Military Cinemas - can you help fill in the gaps or give more information on the buildings pictured? Thanks to Kenny Thomson, Bryan Groat, David Low, Melvyn Gould and Paul Francis for the images so far. Thanks to the Cinema Theatre Association Archive, we can now add images of the Picture House Selkirk, an interior of the Playhouse in Peebles, and an advert for the Grand Central in Glasgow, plus new images of the Argyle cinema in Glasgow and an artists impression of the Aldwych, Glasgow. A 1908 colour postcard advertising the Glasgow BB Wellington Palace has been added. More information has been added about the County Kinross, thanks to Dave Stewart. Kirkaldy's Rio Bingo has closed because of the smoking ban - thanks to Ian Grant for the information. The bar in the former Parade cinema in Glasgow has closed, according to Norrie Mcnamee. Detailed information about the equipment visible in the Star Palace has been added thanks to Frank Watson - it's a spotlight, not a projector! A new page for Loanhead has been added, thanks to images from Paul Francis. Thanks to the Scottish Screen Archive at the National Library of Scotland, we can add a page for the demolished Edinburgh Palladium, as well as interior shots of the Regal in Broxburn, the Playhouse Dunbar, the Vitagraph / Curzon in Glasgow, the Empire at Larkhall, the Playhouse Peterhead, and the Allanpark in Stirling. Thanks to George Millar, we've added a new page for Kinross, new pages for the Dundee cinemas the Kinnaird, the Regal, and the Palladium/Rex, plus new 1950s archive photos - including interiors - of the Regal in Peterhead, the Regal in Blairgowrie, the Regal in Macduff, the Palace in Methil, the Rex in Crieff, the Picture House in Tayport, the La Scala in Cupar, the Regal Auchterarder, the Playhouse in Stornoway, and in Dundee, for the Victoria, and the Broadway. A page for Rutherglen has been added, incorporating a plan of Green's cinema there, courtesy of Chris Doak, plus images and details of the Grand Central Cinema there. Pictures of the long-hidden and forgotten projection equipment in the Star Palace, Glasgow, can now be seen thanks to 'Socceroo'. As part of a project to create a complete 3D computer model of the 1938 Glasgow Empire Exhibition, a lovely 3D interactive model of the Empire Cinema can be seen here. Dundee City Council have passed an application to convert part of the ex King's / Gaumont / Odeon in the Cowgate into a casino by creating a new floor level at the top of the first balcony, and restoring the remaining decorative ceiling dome. A new planning application is being considered by South Lanarkshire council to demolish the C(s)-listed former Victoria Music Hall / Granada / Playhouse in Hamilton. There's an interior picture of the proscenium and organ of the La Scala, Glasgow in the 'Christie Book of Golden Notes', on the Theatre Organs website. Scroll down to page 14. A large gallery of new interior photos from the Open Day of the Alhambra Dunfermline have been added, showing the impressive scale and design of the interior. The open day was also covered on the BBC News website here. The former UCI (now Odeon) Fort Kinnaird, Edinburgh is due to close on 13th January 2008 - thanks to Graham Kelly for the information. Glasgow City Council has passed the revised plans for the former Paramount/Odeon building: the auditorium is to be entirely demolished and replaced with an eight-storey glass tower. The planning committee report can be read here. Coverage in the Evening Times is here; and generally negative public comments on the scheme in the Evening Times letters page here. The Campbeltown Picture House has re-opened after having work done to repair the auditorium roof. Details in the Cambeltown Courier here. A new book has been published to celebrate 150 years of the Britannia / Panopticon Music Hall in Glasgow. Called 'Stan Laurel & Other Stars of the Panopticon - the story of the Britannia Music Hall', it is written by Judith Bowers and is available here. Fort William's cinema could re-open according to reports in the Lochaber News here. The application to demolish the fire-damaged Rialto in Lochee, Dundee has been withdrawn by its owners. Plans to completely demolish the remains of the Palace in Burntisland appear to have been shelved for the moment, according to Fife Today. Councillors in Dunfermline passed plans to re-open the ex-Robins cinema as a lap-dancing club, as they hadn't been told what sort of club it was going to be! Link. There have also been numerous updates to the Cinema Database, thanks to information from Robert Main, Ross McNeillie, Alastair Kerr, Ian Grant, Isabel Fry, and Tom McPherson. Apologies for the lack of updates recently, due to real world issues intervening! The Odeon Multiplex at the Braehead X-Scape centre finally opened on October 18th, over 18 months later than originally planned. It has 12 screens, ranging in size from 110 to 355 seats. Official site here. The Alhambra in Dunfermline will soon hopefully be re-opened and restored to its former glory. Details on the Alhambra website; there will also be an Open-Doors day allowing folk a look round on Saturday 1st December. This has also been covered on the BBC Website. There is also an interesting page of photos and information on Dunfermline's cinemas on the KineMagigz.com website here. A new planning application has been submitted (ref.HM/07/0676) to entirely demolish the B-listed La Scala in Hamilton, and replace it with an office block. Previously, an application for partial demolition, retaining the street facade, had been granted, though no work was ever done. The owners of the New Victoria / Odeon Clerk Street in Edinburgh have applied for to extend planning consent for flats on the site of an old garage to the rear of the cinema. This consent had previously been granted, but had since lapsed. The future of the main cinema building itself is still uncertain; although several formal bids to buy the building were received before a revised closing date in September, it is unclear as to whether or not the current owners will accept any of them. The plans for replacing the auditorium block of the Paramount / Odeon Renfield Street in Glasgow with a 9-storey glass tower have been revised slightly; removing one storey, but increasing the floor-print of the remaining stories. It provides slightly more detail in its plans to restore the foyer facade, but also now includes punching several new windows into the retained fabric. The plans are still being considered by Glasgow City Council. A Which? report into cinema going, highlighted in the Independant, picked out the Cameo in Edinburgh as an example of the best of British cinemas; particularly highlighting its excellent range of films. The full article can be read here. A planning application to insert a rooftop smoking terrace on the B-listed ex-Caley cinema in Edinburgh has been declined by Edinburgh City Council. Historic Scotland have published a summary of the responses to their consultation on changing the way they list historic buildings; the summary can be seen here. BBC News reports that an archaeological dig at a military base near Fort William unconvered the concrete floor of a military cinema in a Nissan hut - details here. A house owned by cinema magnate Sir Alexander B King, and which was stayed in by Laurel & Hardy when they visited Scotland, has been up for sale, and had problems finding a buyer, according to the Daily Record. An archive image of the Regal cinema in Shotts, now demolished, featured in the RCAHMS 'Treasured Places' survey - details here. The new cinema in Hawick, part of the Heart of Hawick complex, opened on October 8. Details here. Cinema has returned to Leven, in the form of film showings at the Denbeath Miners' Welfare Institute, according to Fife Today. Plans to turn the old ABC Regal in Kirkcaldy into a recreation centre for children and teenagers have been mooted, also according to Fife Today. The Oddfellows Hall in Edinburgh, a short-lived cinema, has had something of a makeover, according to new photos in Architecture Scotland. Norman Harper has kindly provided photos and information about the Glen Cinema, Alford, Aberdeenshire. The programme for the 2007 Doors Open Days has been published, and includes the Aberdeen Tivoli, the Bo'Ness Hippodrome, and the Newton Stewart Cinema. The Edinburgh Evening News has run a story with the latest news on the Edinburgh New Victoria/Odeon; details here. New pages have been added in the Paisley section, for the Town Hall and Electric / Central Hall cinemas there. Outside Scotland, a new page has been added for Cambridge, following a visit there. New photos of the proscenium area of Pringle's Bijou Hall have been added, temporarily revealed during demolition works. The Gala bingo in the ex-Rialto, Airdrie, is to close on 25th August. A worker has died after a floor collapsed during work to convert the Falkirk ABC into a sports bar, according to BBC News. English Heritage have put their Buildings At Risk list online; it includes a number of English cinemas. Cinema for Thurso have put up a gallery of photos from their explorations of the ex-Breadalbane Cinema, Wick - click here for more. The Hillhead Picture Salon has reopened after major refurbishment works as the Salon Bar & Restaurant. Much of the unique ceiling plasterwork has now been revealed and restored. A gallery of photos of the ceiling and the the opening night has been added, as well as some archive shots courtesy of the Scottish Screen Archive. An opinion piece in the Scotsman names the New Victoria / Odeon cinema as one of the Seven Wonders of Edinburgh. The BB Cinerama in Eglinton Toll was demolished in 1986, and the site is currently being excavated to allow flats to be built on the site. Some familiar looking bits of stonework have turned up! Thanks to the eagle-eyed Rod Alexander of Pure Dead Brilliant Tours for spotting these! There's to be an Evening of Laurel & Hardy on Sunday 5th August at the Regal Cinema in Larnark - see here for details. The Scotsman reports that the UCI Fort Kinnaird, Edinburgh - recently rebranded as an Odeon - is to close. This was the first multiplex in the Edinburgh area, opening in 1988. A giant open-air cinema could be a feature in Glasgow's Kelvingrove Park, according to the Evening Times. Planning permission has been granted for alterations, involving restoring the unique ceiling decoration, at the former Salon cinema, Hillhead, according to The Herald. New information has been added about the Magnum cinema in Irvine, and the Douglas, Milngavie, thanks to Graham Kelly. In other news, the Cinema Newton Stewart is celebrating 10 years since it re-opened, and film is to return to Hawick as part of the 'Heart of Hawick' regeneration of the town centre. The Dounreay Social Club in Wick is to close; this was formally the Breadalbane Cinema. The website of the Cinema for Thurso group has been updated with new galleries, including ones of the ABC Lothian Road, Edinburgh, the Phoenix and New Phoenix Kirkwall, the All Star Factory and more. Thanks to Darren Manson, we can add a couple of interior pictures of the ABC Lothian Road, and Kenneth Duncan has sent some shots from its closing night. The Town Hall Picturehouse cinema in Tain is to be refurbished; there are some photos and plans on the website here. It turns out this is Category B listed, and has therefore been added to the Listed Cinemas page. A photo of the demolished Pollok Picture House can be seen at theGlasgowStory.com website here. Thanks to manager Ross McClung giving us the chance to look around, we have a new gallery of photos of the ex-La Scala Clydebank; we've also updated the photos of the ex-UCI cinema there to show its new signage as the Empire. A new panoramic photo of the Govanhill Picture House in Glasgow have been added; showing it from a different angle than usual. Updated photo of the refurbished exterior of the La Scala, Helensburgh, in its new guise as the Logie Baird pub. New photo of the Regal in Larkhall, taken from an old postcard of the town. The bingo in the Regal, Macduff, will close later this month due to the smoking ban; new photos courtesy of David Low and Colin Munro. New photos have been added of the exterior of the Radio in Kilbirnie. Thanks to Jim Brooks, more photos of the demolition of the City Cinema in Aberdeen. Better photos of the Plaza, Hilltown, and Victoria, Dundee, thanks to Donald Kirkbryde. Latest press coverage about the ex-Odeon in Edinburgh in the Evening News, here and here. The New Picture House in St. Andrews won a UK Independant Cinema Award in February; in Aberfeldy the 'Friends of the Birks' cinema have been given £10,000 towards a proposal for a 100 seat cinema in the building; in Grantown-on-Spey, the former Picture House, now a British Legion, has shown a film for 1st time in 50 years. Films are now being shown at the 'Montrose Picture House' - actually the Mitchell Centre in George St, a former church with pew seating - see their website here. Updates to the Scottish Cinemas Database, thanks to David Low and Gordon Adams. A new article has been added - Memories of being a projectionist in Edinburgh's cinemas in the 1960s, by George Field. The Evening Times letters page featured some feedback on the proposed Odeon Glasgow plans (see 10/5/07 below) on both the 15th and 17th of May, which can be seen online here and here. Thanks to Dorothy McCallum of the Scottish Historic Buildings Trust, we've added a gallery of photos of the work-in-progress to restore the A-listed Hippodrome in Bo'Ness. The City Cinema in Aberdeen - latterly used as a bowling alley - is in the process of being demolished. Thanks to Jim Brooks for the information and photo. A three-part video tour of the Edinburgh Odeon Clerk St can be found on YouTube here (thanks to 'Dr Bloodsplatter' for the link!). Outside of Scotland, we have new pages of photos of cinemas in Bath and Huddersfield. The front cover of today's Evening Times features the latest plans for the B-listed old Paramount / Odeon building in central Glasgow. These new plans involve demolishing the auditorium block entirely, and replacing it with an 11-storey high glass office and leisure block. The corner facade would be retained and refurbished. Full details and an artists impression of the plans in the story here. A similar story in The Herald suggests the new block may be capable of having films projected onto it; the full plans are due to be lodged with the council later this week. The BBC News website also has a story on the plans here, and more pictures can be seen on the ArchiSeek website here, and the Glasgow Architecture site here. The ex-La Scala in Grangemouth has been listed Category C(s) by Historic Scotland; the building is currently sitting empty after the bingo closed earlier this year. The proposed redevelopments at the ex-Hillhead Picture Salon in Vinicombe Street, Glasgow were covered in the Evening Times on 25th April. A letter in The Herald on April 23rd commented on conversion of the Old Athaeneum theatre on Buchanan Street, Glasgow into retail space. Plans have been granted to demolish the ex-Cinema in Galston, currently a vetinary surgery, to put flats on the site. An exhibition of the history of cinema-going in the St. Andrews area can be seen at the St. Andrews Museum, Kinburn Park, from 16th May to 24th June. Open 10am - 5pm, 7 days a week. The council decision to allow demolition of most of the Govanhill Picture House to go ahead was covered by the Glasgow Evening Times yesterday here; there are some very interesting comments from readers after the article! A new multiplex may be constructed in Kirkcaldy, returning cinema to the town which has had none since the 3-screen ABC closed in 2000, according to Fife Today. Thanks to Ian Grant. The Lyceum in Glasgow would seem to have changed hands in January for the surprisingly small amount of £285,000. No information is currently available as to who the purchaser was though. We can now present stunning new pictures of the neon displays of the Toledo, New Bedford, and Pavilion Theatre in Glasgow. New pics of the Odeon and Green's Playhouse in Ayr lit up at night have been added. Thanks to Emma Mykytyn, photos of the Barrhead Centre Cinema have been added now it has closed as a bingo hall. Steve Lynch has sent more photos and a fantastic 1950s playbill for the Kelty Gothenburg Picture House. New photos of the fire damage to the Rialto, Lochee have been added, thanks to Keith Todd. More information and photos of the Inverkeithing Majestic have been added, thanks to Rose Brown (via Harry Rigby). Thanks to new photos from Scott McCutcheon, we've been able to add interior photos from the Hall and Strand cinemas in Alexandria, as well as new interiors of the Allanpark in Stirling. A picture of the interior of the Keith Picture Palace has been added, thanks to David Low, who has also provided a nice advert for the Picture House in Elgin. In Aberdeen, Jim Brooks has kindly provided a series of pictures of the stage and projection areas of the Capitol cinema there. We also now have more photos of the demolition of the Hampden Picture House. Glasgow City Council has today passed plans to demolish the B-listed Govanhill Picture House (pictured above), retaining just the entrance portico with new build flats behind and around it. The final decision on whether to go ahead now rests with Historic Scotland. A new application has been lodged to completely demolish the B-listed ex-Rialto cinema in Lochee, Dundee [ref. 07/00230/LBC], and there is also another application to demolish the long derelict Palace in Burntisland, Fife [ref. 07/00862/CFULL]. The news earlier that the Gala bingo in the ex-La Scala cinema in Clydebank had closed was incorrect - it's still open, and will remain so until the Autumn at least. Thanks to manager Ross McClung for the correction. The Helensburgh La Scala will be re-opening as a pub called The Logie Baird on the 11th of April - thanks to Graham Kelly for the information. In a somewhat depressingly demolition-themed update, we have galleries of photos of the Opera House in Lochgelly being flattened thanks to Ian Ross, the Playhouse in Fraserburgh biting the dust thanks to George Basterfield and Eric Morrice, and the Hampden Picture House in Glasgow losing a fight with a bulldozer, thanks to John Duncan and Norrie Mcnamee. We've also added a nice weekly programme for the Regal in Dunfermline, from September 1963. John Pottage managed to gain access and take photos of the disused balcony area of the ex-Palace cinema in Leith, which seems to remain reasonably intact. The restaurant Gong, in the ex-Hillhead Salon Picture House in Glasgow closed on 31st March. A planning application for refurbishment works to punch skylights in the ceiling and extend the balcony fully forward is currently being considered by Glasgow City Council, and stripping out works have already commenced. Plans to demolish the ex-Pringle's Picture Palace (later Gateway Theatre) in Edinburgh have been passed by the local council; coverage in the Evening News. The Edinburgh Filmhouse is continuing to explore possible sites for a new 5-screen Sean Connery Film Centre to replace its existing facilities. One option is in Leith, according to the Evening News. A new Screen Machine mobile cinema has been purchases for the south of Scotland, according to BBC News. A planning application to demolish the auditorium of the ex-Palace cinema in Rosyth, and to put flats on the site, is being considered by Fife Council. The Planning Application can be seen online here [ref. 07/01064/WFULL]. New and updated information has been added to numerous entries in the Scottish Cinema Database, thanks to information from: David Baker, George Basterfield, Jim Brooks, Rose Brown, Martin Carroll, John Duddy, John Duncan, George Field, Allan Goodall, John Hector, Tommy Henry, Alan Ingram, Donald Kirkbryde, Jim Lindsay, David Low, Steve Lynch, Norrie Mcnamee, Colin Mayall, Jim Mitchell, Alexander Murray, Harry Rigby, Ian Ross, John Pottage, David Thomson and Keith Todd. Outside of Scotland, we have new photo galleries for 4 stunning London cinemas & theatres: the Odeon Muswell Hill, the Gaumont Wood Green, the Phoenix Charing Cross Road, and the State Kilburn (the State was the largest cinema ever built in England - beaten in seating capacity only by the Greens Playhouses in Glasgow and Dundee!). More photos of English cinemas can be seen on the English Heritage website here. The Shetland News reports that the nightclub in the former 1913 North Star cinema in Lerwick is due to close, and the building is likely to be converted to housing. The Leith Film Festival will be held in August from the 6th-11th, in what was originally the Central cinema in Leith, projecting films onto its original plaster screen. The Herald had a story about the impact of the smoking ban on Scottish Bingo Halls. Two have been charged after a boy fell through the roof of a bingo hall in Peterhead - originally the Kingsway cinema there. Coverage in the Buchan Observer and BBC News [thanks to Donald Kirkbryde for the links]. The Cinema for Thurso group have added more photos to their website, including some fantastic photos of the interior of the La Scala, Inverness, and of the Moving Picture Show mobile cinema in Thurso Town Hall - see here for more details. Thanks to new images from Paul Francis, we have new images of cinemas in Bonnyrigg, Eyemouth, Haddington, Kinghorn and Newtongrange. 25 new pages added to Glasgow; with basic coverage now of the: Ardgowan, Argyle Electric, Coronation, Empress, Govan Cross Picture Palace, Grafton, Kinema, Louvre, Lyric, Lyric Theatre, Majestic, Maxwell, New Bedford (I), Palaceum, Paladium, Parkhead, Picturedrome, Royal, Scenic, Seamore, Scotts Annfield Electric, Sun, Temple, Tollcross / Greens, and Wellington Palace cinemas. New images courtesy of the Gould Theatre Collection - a new page for the Crown in the Gorbals, an interior photo of the New Star in Maryhil, and the original facade of the Salon, Sauchiehall Street, plus nice interior shots of Pringle's Picture Palace in Edinburgh, and an exterior of the original Picture House in Princes Street. There are also now improved images of the Stobswell / Ritz and West End / Shands cinemas in Dundee. The bingo in the Hayweights Cinema in Musselburgh has closed, another victim of falling attendances due to the smoking ban, according to the Edinburgh Evening News. Major update for the St. Andrews page, with new photos and details of the Cinema House, and La Scala, thanks to Lesley Lettice of the St. Andrews Museum. The Scottish Screen Archive has also kindly provided stunning interior pictures of the Cinema House. Thanks to new images courtesy of the Scottish Screen Archive, we can also now add new images for: the Gem, the New Grand, the New Star, the Star / Pringle's, the Rhul and the Roxy in Glasgow, the second Palace in Arbroath (plus colour interiors of the third Palace), the Regal in Brechin, the Bank in Clydebank, the Palace / Savoy in Dundee, the Regal, Palace and Opera House in Dunfermline, the Playhouse in Dunbar, the Playhouse in North Berwick, the Hippodrome in Hamilton, the Carlton, the Palace and the Port Brae Picture House in Kirkcaldy, the La Scala in Motherwell, the Winton in Tranent, and the Pavilion / Plaza in Wishaw. A new page for the Kinema, Newmills, in Fife has also been added, thanks to images from Ian Ross, and also a new page for Aberlour, thanks to David Low, who has also sent a photo of the Town Hall Cinema in Lossiemouth. In other news, a new 8-screen multiplex has begun construction in Stirling, to be run by Vue Cinemas, which may have a damaging impact on the Allanpark. A new Cinema Heritage Group has been set up in Ireland - see here for more details. Brand new pages for Buckhaven, Cupar, and Lundin Links, the Grand in Edinburgh, plus new photos of the Odeon in Hawick, and the Imperial and Palace cinemas in Methil, thanks to Paul Francis. New page with images of the Empire Cinema from the 1938 Empire Exhibition in Glasgow. New images added for: the Palace in Arbroath, the Regal in Forfar, the Alhambra in Monifieth, the Alhambra/Odeon in Perth, the West End/Gray's and the Queen's Hall in Dundee, the Rex in Cardenden and the Regal in Kelty, plus fantastic new images of the interior of the Crieff Cinema, all thanks to Paul Francis. The Gala bingo in the former La Scala cinema in Clydebank has moved out, leaving the future of the building uncertain - thanks to Jim Lindsay for the information. In Grangemouth, the Carlton bingo in the former La Scala cinema there has also closed, according to Falkirk Today (thanks to Lindsay Hutton for the info). The Mission bar, in what was the former Queen's / Tonic cinema in Glasgow, is up for sale. New pages for some more demolished Glasgow cinemas - the Casino, the Mayfair, the Mosspark, the Palace, the Phoenix, and the Plaza, plus the Oxford Playhouse thanks to the CTA Archive, as well as new images of the Viking in Largs. Major update to the page for the ABC Regal in Glasgow, with a much more detailed history of the building, and many new images of the building from all points in its history, all thanks to new photos from the Scottish Screen Archive, the CTA Archive, Kevin Gooding, Scott McCutcheon and Bruce Peter. In addition, we have a new page for the demolished Rex / ABC in Riddrie, Glasgow, thanks to the Scottish Screen Archive, and new colour images from inside the Tivoli, Crow Road in Glasgow, thanks to Bruce Peter. As you may have noticed, we are no longer the Scottish Surviving Cinemas project, but rather simply the Scottish Cinemas project - this better reflects the ever-increasing coverage we have of cinemas long since gone. The web-address has also changed from survivingcinemas.org.uk to scottishcinemas.org.uk, but all existing links, bookmarks and email addresses should continue to work correctly and transparently forward [Please let us know if you encounter any problems]. In Glasgow: the Arcadia, the Camphill, the Dennistoun Picture House, the Govan Cinema, Scott's Electric Theatre and the Western. In Dundee: the Astoria, the Broadway, the Empire, the Forest Park, the Regent, the Stobswell / Ritz and the Victoria. Plus, in Clydebank: the (original) Empire. Thanks to Kenny Duncan for confirming that the Rialto, Lochee is still standing at present. Not so lucky is the Royal in Dundee, which has sadly been demolished in the last few weeks, according to Jimmy Smith. The Evening Times published a letter following up on the Odeon Renfield Street story mentioned below. New pages for Brightons, Larbert, and Lennoxtown are now in the Scotland A-Z, and there is new coverage of the demolished Rio in Canniesburn, Glasgow, and of the Dalmuir Masonic Hall, thanks to new photos from Paul Francis. David Low has provided a gallery of current interior photos of the Playhouse in Elgin. A recent story and lead editorial in the Evening Times highlights that the Odeon Renfield Street is still empty, a year after closing. A demolition warrant has been issued for the B-listed, fire-damaged Rialto, Lochee, although it's unclear if this work has taken place or not yet [if anyone from around Dundee can go and check, that'd be very handy!]. New pages have been added for Holytown, thanks to Paul Francis, and for Kingussie and Newtonmore, thanks to photos from Frank Haughey (via Norrie Mcnamee). More photos from Paul Francis means we can also add new coverage for the Regal in Greenock, the Roxy in Hamilton, the Electric in Motherwell, and the Palladium in Paisley. In Dundee, a new page for the Plaza, Hilltown has been added thanks to Neale Elder, one for the Royalty thanks to Jimmy Smith, and some archive postcards of Green's Playhouse and the King's, thanks to Ronnie Ray. We've also got a guide to 'What's On' in Dundee cinemas and theatres from September 1950. In Aberdeen, we have updated images of His Majesty's Theatre, thanks to Jim Brooks, details of the entrance to the Kingsway cinema, thanks to Alison Thewliss, colour interior shots of the Capitol, thanks to Bruce Peter, and an updated shot of the Palace cinema, thanks to Mike Wood. Several cinemas in Rothesay have had their pictures updated, thanks to Emma Mykytyn, and a photo of the house of the manager of the Windsor cinema in Carluke has been added, thanks to Alison Thewliss. 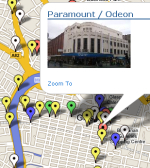 We have a lot of updates and new material planned for the next few months, but first something a bit different - a new interactive, zoomable map of over 180 of Glasgow's cinemas, past, present and future. This lets you see where all the cinemas were, and once you've found a cinema of interest, you can click on it to go directly to its information page. Click here to go to the map. A planning application has been lodged with Perthshire council to demolish the ex-Regal in Auchterarder and replace it with flats; the application can be seen online here. Thanks to Donald Kirkbryde for letting us know about it. The proposed refit of the Kings Theatre in Edinburgh has been shelved due to financial considerations, according to the Evening News on December 28. It also reports plans to re-open the Odeon Clerk Street as an artists studio and cinema have stalled. According to AllMediaScotland.com, 6 cinemas in Scotland are amongst 50 UK-wide to benefit from grants to improve their facilities, especially for wheelchair access. There have also been updates to the Cinemas Database, thanks to new information from Kevin Adams, Neale Elder, Willie MacFarlane, Derek Mathieson, and Jim Mitchell. Unless otherwise specified, all photographs and other material copyright (c) 2001 - 2007 Gordon Barr and Gary Painter.